Macropinocytosis, the cellular uptake of fluids from the environment, is employed by a variety of cells and requires the formation of a cup-shaped structure that protrudes from the cell’s surface and captures gulps of medium. 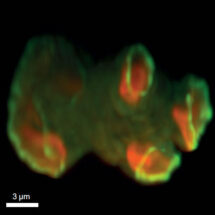 Polymerisation of actin under the plasma membrane drives the extension of macropinocytic cups. However, until now it has been unclear how the actin forming the walls of the cup is shaped into a ring. Work by Douwe Veltman from Rob Kay’s group, in the LMB’s Cell Biology Division, in collaboration with Eric Betzig and Bi-Chang Chen at the Janelia Research Campus in the USA and Robert Insall at the Beatson Institute in Glasgow, has resulted in the formation of a new hypothesis for how these cups form. Using lattice light sheet microscopy, which generates 3D images, and other advanced microscopy, in combination with fluorescent reporters and mutants, they have shown that during cup formation, a patch of active Ras and PIP3 is generated in the plasma membrane around which the SCAR/WAVE complex is recruited in a ring, avoiding the patch centre. It is SCAR/WAVE that then leads to actin polymerisation to drive extension of the cup walls. This hypothesis, if true, is widely significant as many cell types form these specialised feeding macropinocytic cup structures. Cancer cells use macropinocytosis to feed on nutrient-rich fluids in the body and immune cells employ the process to sample antigens from their environment. In addition, macropinocytosis is also exploited by bacteria and viruses to gain entry to a host cell, and it may be a mechanism by which neurodegenerative diseases spread in the brain. As a result, macropinocytosis is a potential target for new drugs to treat a range of diseases and an improved understanding of the underlying process will aid in drug development. Top view of a Dictyostelium cell making macropinosomes as viewed with a lattice sheet microscope. The cell makes two modified proteins which reveal the location of its F-actin cytoskeleton (purple) and of an active Rac protein that controls formation of this cytoskeleton (green). Both are recruited to the macropinocytic cups. This work was funded by the MRC and the BBSRC.